Dr Ong (third, left) chairing the recent meeting of Suksar officials. KUCHING: Sarawak wants to build a strong team once every two years for the Malaysia Games (Sukma). So talent identification must be the most important part of the upcoming Sarawak Games (Suksar). 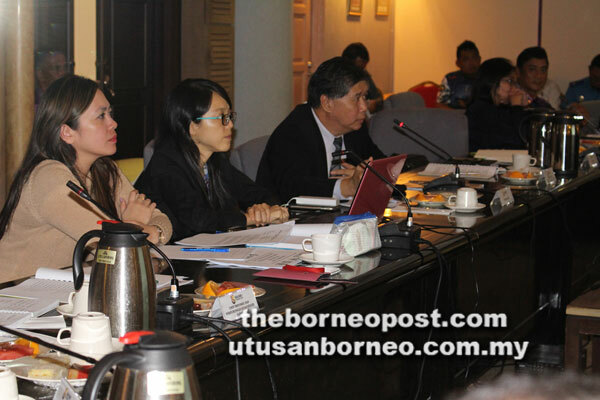 This point was stressed by Sarawak Sports Corporation (SSC) CEO Dr Ong Kong Swee in a recent meeting of the organising committee which included Residents and their representatives. According to him, it is not only Sarawak which is organizing such a multi-sports event at the state level. Other states like Selangor, Sabah and lately Terengganu are also organising their own state-level games for the purpose of getting ahead in sports development. “The Suksar Games must be treated as an important ground for talent identification. ‘Your chief coaches must come to the venues of competitions to select the potential athletes. They must make sure they get right potential athletes as they can see where others might not be able to spot. ‘They must see the potential in the athletes and not necessarily those who win gold medals for the athletes are very young and can develop into good athletes if they have the correct potential,” Dr Ong added. Over 1,000 athletes and officials will be involved in the 2017 Suksar which will be contested among four zones: Southern (Kuching, Serian, Samarahan), Western (Betong, Sri Aman, Sarikei), Central (Sibu, Mukah, Kapit) and Northern (Miri, Bintulu, Limbang). The 14 sports for competition are swimming, athletics, archery, weightlifting, cycling, sepak takraw, muaythai, badminton, judo, karate, lawnbowl, petanque, handball and rugby. Para athletes will compete in three sports namely archery, athletics and powerlifting. The 2017 Suksar will be held mainly in Kuching from Dec 17-19.